Micro vs. Copy Brands: What Makes Micro the Premium Brand? We get it, there are a LOT of scooter companies out there. It seems like the number is growing each day! This leaves many shoppers to question just what exactly is the difference between each brand? We’ve put all of the details together in this blog post to help you get the full picture, and to see why Micro is the cream of the crop. Movers and Shakers: Micro has been the innovator in scooters and kickboards since 1999 when it introduced a new 2 wheel scooter that was light weight and foldable. Micro licensed it to JD Sports and sold under the name Razor. In 2003 Micro became was the first to create a 3-wheel kickboard style scooter for young kids: the Mini Micro. It was designed with two wheels in front, a development that made it significantly more stable for even the youngest kids. Since then, Micro has been continually improving and upgrading the Mini with new materials and design improvements to make it more smooth-gliding, stronger and more stylish. The original concept and its upgrades since have garnered Micro many awards over the years. Along the way other companies have copied the style of our scooters, and borrowed descriptions of our scooters' features, but they haven’t been able to copy the quality. Quality Scooters. Our scooters last for years because they’re made with tried and true materials. A few of our secret ingredients include the thick polyurethane in our wheels, the way we “rust-proof” our scooters via anodization, flexible fiberglass infused decks, and ergonomic hand grips. Each element of our scooters has been refined for years, resulting in our current (amazing) lineup. How long have we been perfecting them? For almost 20 years, since our Swiss founder, Wim, had the brilliant idea of a scooter for adults. (Read more about that here). Tinkering is in our Swiss roots, and we’re always tinkering till we get things just right. We’ve been around since the 90’s, so if you’re seeing a scooter that looks similar, you can bet it’s from a copy brand. The issue with this is that copy brands aren’t using premium materials in their scooters, meaning their final product won’t last as long, or stand up to as much wear & tear as a Micro. It may even feel uncomfortable to ride, as our premium materials assist in gliding over bumps, eliminating rattle and shake, and providing overall comfort on your ride. 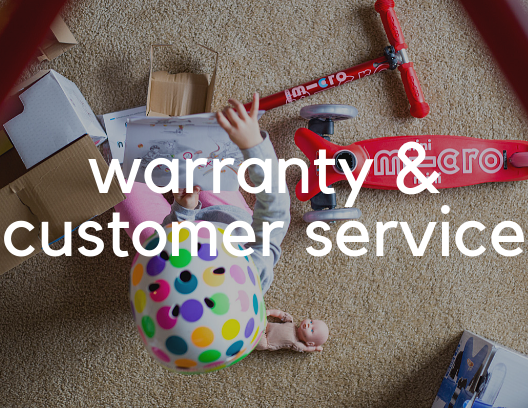 Warranty & Customer Service: Did you know companies can win awards for their customer service? It’s hard to do, but we did it! Micro is proud to offer customers our award-winning customer service which is one reason many people come back to purchase time and time again. You won’t have to worry about dialing a string of numbers before you finally speak to a person. We’re available M-F, 9-5 EST from our office. Simply call 888-236-5657. Comparing a copy brand? Try to find their phone number. Many other scooter companies don’t have anyone to call in case of an issue. As for warranty, do you know if you’re getting one? If your scooter does have a warranty, what does it cover? It’s sometimes silly to see the warranties that other scooters present. We’ve been caught wondering if there’s any actual coverage buried in all of that legal jargon. You can trust that Micro’s 2 year warranty will back you up. Scooters are super fun and people (kids especially) love to ride them. Our warranty protects you against manufacturing defects and faults in craftsmanship. There are a few parts that will wear with normal use (we call these “wear and tear” parts), and these are not considered a warranty consideration. You can read more about our warranty here. We offer affordable replacement parts for every last bit of our scooters, and the video instructions on how to replace them. This is another reason we love our Swiss-designed roots; our scooters are built with as few parts as possible, making even the least handy person a scooter refurb superhero. Oppenheim Toy Portfolio Platinum Award: These represent the most innovative, engaging new products of the year. Oppenheim Toy Portfolio Gold Seal Award: Given to outstanding new products that enhance the lives of children. 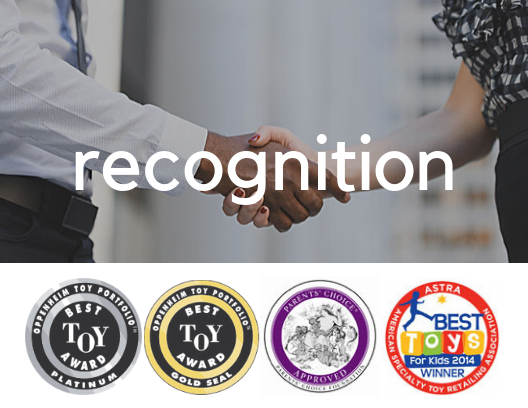 ASTRA’s Best Toys For Kids Award (Classic Play): Given to the fun, top-quality products with high play value that consumers can find in locally owned neighborhood toy stores around the country. Parents Choice Awards: Parents' Choice Foundation's panels of educators, scientists, performing artists, librarians, parents and, yes, kids themselves, identify the very best products for children of different ages and backgrounds, and of varied skill and interest levels. Tillywig Top Fun Toy Award: Products that stand out in terms of exceptional design, construction, and play. When you purchase a Micro, we want you to know that you’re getting a great product. 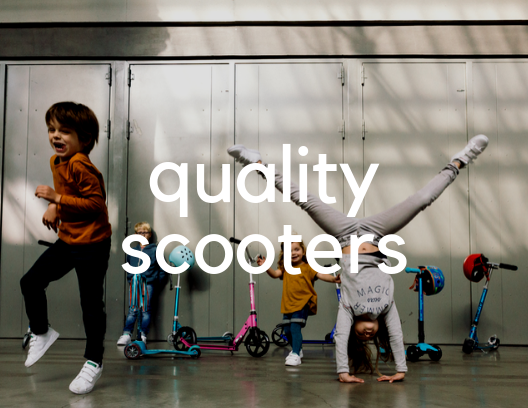 It’s wonderful to hear from so many customers that they pass their scooters from kid to kid, and family to family when children grow out of them. Our scooters last. And we’re proud to stand behind them with great customer service! We hope that this answers your questions about the differences between Micro and copy brands, and that you’ll trust our products in your home. We’re sure you’ll love them! Subscribe to Micro e-mails for exclusive updates on upcoming products, notifications of special offers, and the latest news in the scooting world. 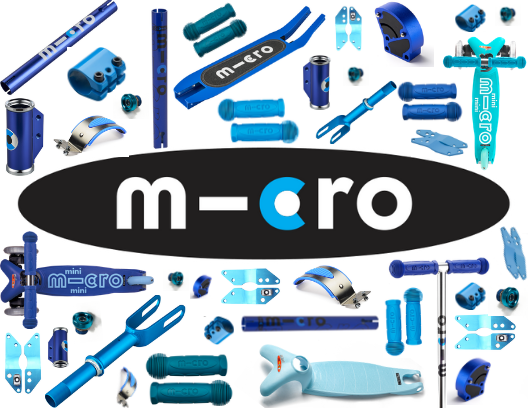 Micro Kickboard is the official US distributor for innovative Swiss company Micro-Mobility, maker of the world's best-rated scooters and kickboards and other innovative products used for urban mobility. Micro leads the revolution in personal transport for urbanites and suburbanites alike and from its start in 1999 Micro has been known for its minimalist designs and precision engineering using quality materials, winning prestigious design awards worldwide. Fuel-free, foldable, smooth-gliding! We would love to hear any suggestions or answer any questions you might have. Contact us Monday-Friday, 8am-5pm EST.